Thoetkiattikul pursued biotechnology when she was offered a scholarship to study entomology at the University of Georgia. 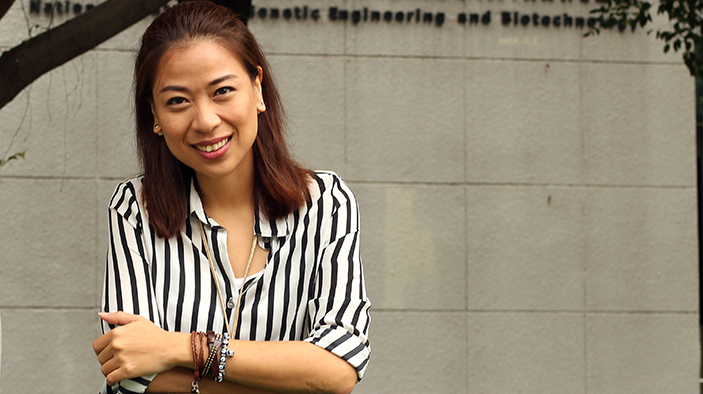 After completing her postdoctoral work, she returned to Bangkok to become a researcher with the Biotechnology Center of Thailand’s National Science Park, the country’s leading science and technology institute. But after many years conducting research, she said was ready for new challenges outside the lab. When she expressed interest about opportunities to diversify her professional experience, her supervisor told her about the ASEAN-U.S. Science and Technology Fellows Program. With support from the U.S. Agency for International Development and the U.S. Mission to ASEAN, in April 2014 the DAI-led ASEAN-U.S. PROGRESS project launched this program which seeks to engage citizens from the 10 ASEAN countries—Brunei, Cambodia, Indonesia, Laos, Malaysia, Myanmar, Philippines, Singapore, Thailand, and Vietnam—to contribute to improving science-based policy-making in the region. Thoetkiattikul could apply her skillset and experience as a scientist to work with policymakers throughout the region. As part of the first wave of fellows, she worked with the National Science and Technology Development Agency to help develop plans to establish Thailand’s first Biotechnology Resources Center. Once the center is established, research institutions, academia, and the private sector will able to pool their resources to create a culture collection with more than 15,000 species of biological micro-organisms that have a range of applications in medicine, manufacturing, and food industries. Thoetkiattikul drafted policy recommendations to develop a regional protocol for sharing and managing genetic resources from within the Center, a necessary part of ensuring transparency and fairness in sharing genetic resources for research or commercial purposes. Through the program, Thoetkiattikul and five other fellows from Indonesia, Myanmar, the Philippines, and Vietnam have received leadership training and opportunities to experience regional and national-level policy-making first-hand. By serving within host government ministries in their home countries, fellows are able to use their science backgrounds to support policy-making. Thoetkiattikul felt that a lack of scientific input hinders science and technology-related policy-making in Thailand and wanted an opportunity to improve the role of science in policy-making. Working closely with a supervisor from the policy-making realm has exposed her to a new world and helped her re-orient her career toward the policy side. “By learning and doing research, I was able to contribute to the scientific community, but by being involved in policy, I can contribute my knowledge to the wider population,” she said. She hopes that with the tools and resources she gained, she can work to improve national and regional-level biotechnology policies and priorities in the future. The year-long ASEAN-U.S. Science and Technology Fellows Program works to advance regional cooperation among the ASEAN countries, strengthen science-based policy-making and empower ASEAN scientists to take a more prominent role in their respective countries’ efforts to integrate into the ASEAN community.